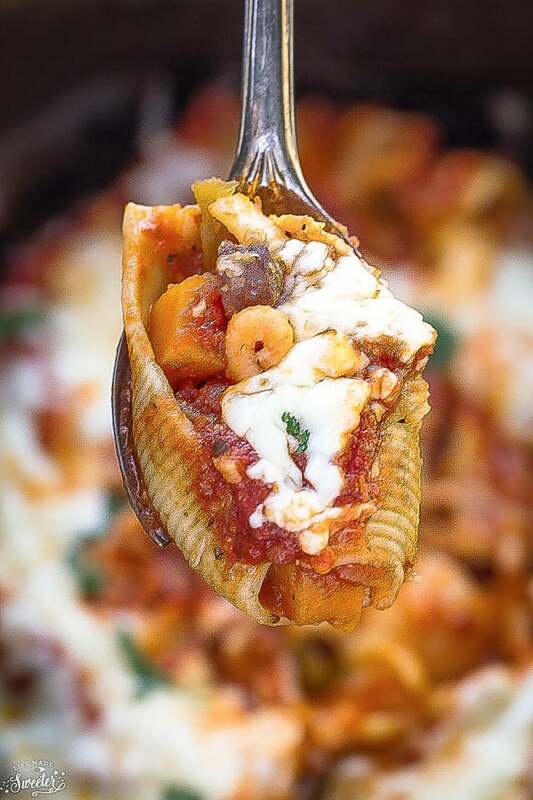 Stuffed pasta shells with a delicious Cajun twist are easy to make and full of bold comforting flavors. Now that my four year old is in school during the day and my one year old is as mobile as can be, it seems like I am even busier in the kitchen whipping up food to keep up with their hungry and growing tummies. 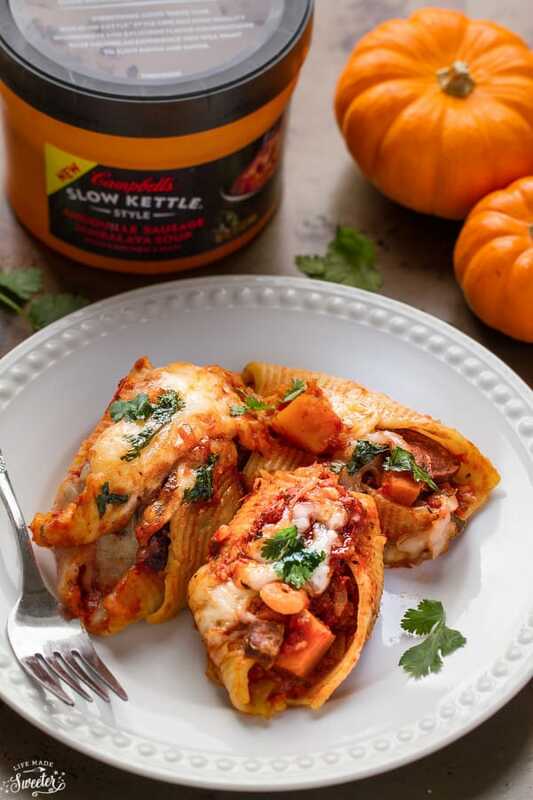 Both kiddos are big soup and pasta lovers so when Campbell’s asked me to come up with a recipe using their new Campbell’s Slow Kettle Style Andouille Sausage Jambalaya Soup with Chicken and Ham, I came up with these Slow Cooker Pumpkin Jambalaya Stuffed Shells. I am a big fan of Jambalaya and craved for it often when I was pregnant with my youngest. This soup has the same great taste and I loved how hearty it is. There are big chunks of sausage along with plenty of diced tomatoes, celery, onions, and tender rice throughout. I scooped out the ingredients and combined it with some roasted butternut squash, cooked rice and tiny shrimp to use as the filling. The soup was mixed together with some tomato sauce and pureed pumpkin which I then poured over the stuffed pasta shells. Everything was tossed into my slow cooker but you could easily bake these in the oven as well. It made the most delicious dinner and my family loved the bold and spicy flavors! I normally wouldn’t make a meal like this on a weekday but with the help of Campbell’s Slow Kettle soup it made everything so much easier even for those busiest nights! 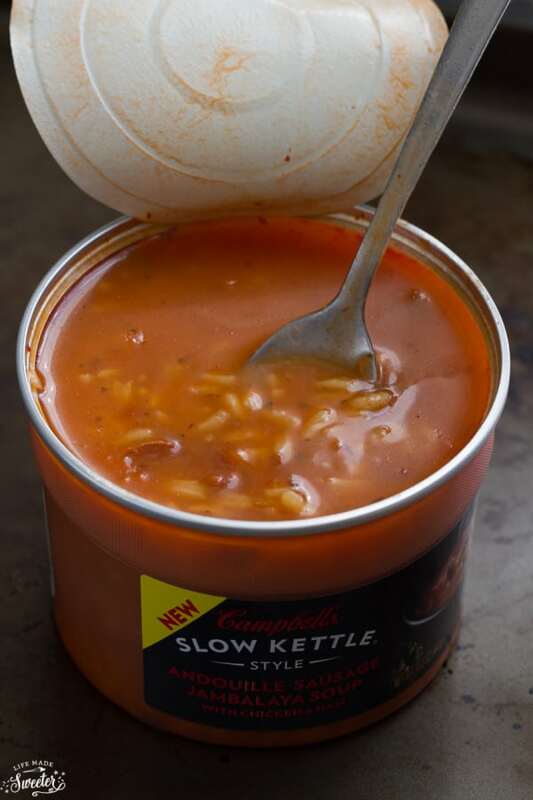 It’s also nice to know that each of the Campbell’s Slow Kettle Style soups is crafted by chefs who carefully combine unique ingredients in creative ways. Available in new delicious varieties like Andouille Sausage Jambalaya Soup with Chicken & Ham Soup (shown here), as well as Slow Kettle Santa Fe Style Chicken Enchilada Soup with White Meat Chicken, there is something for everyone! I love that these Campbell’s soups are made “with patience, not preservatives” and that they use real ingredients that are a cut above (like angus beef, fresh cream, Andouille sausage, Portobello mushrooms, asiago cheese, & Madeira wine). So why not change up your dinner routine next time using some soup? 14 - 16 jumbo pasta shells, cooked according to package directions. Bring a large pot of water to boil and cook the pasta shells according to package directions. Drain and rinse in cold water. Set aside. Separate Campbell's soup and ingredients by using a colander to drain soup into a medium mixing bowl and spoon filling into another large mixing bowl. Whisk tomato sauce, liquid soup and half of the seasonings. Set aside. Mix cooked rice, tiny shrimp, butternut squash with solid soup filling. Season with salt, pepper and remaining half of seasonings. For slow cooker method:Pour and spread 1/2 cup of sauce evenly in the bottom of a crock-pot. 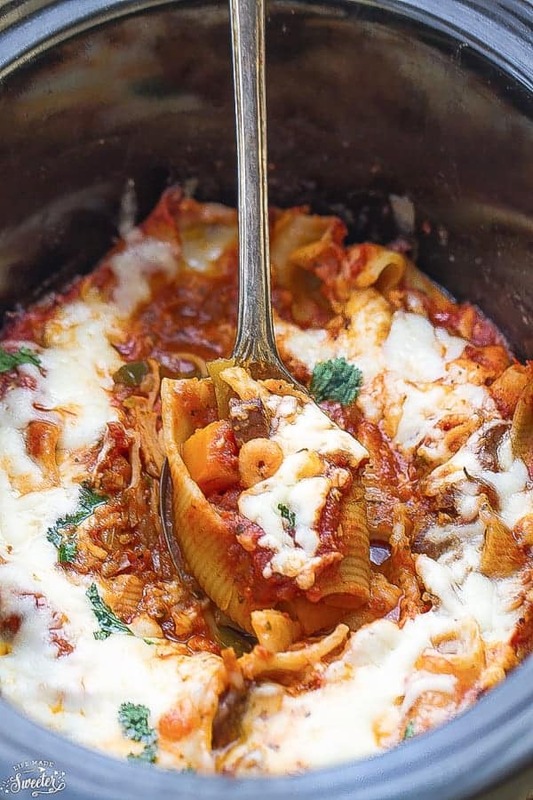 Fill the cooked pasta shells with the mixed rice/shrimp filling and place in the bottom of a crock-pot, side-by-side being careful not to overcrowd. Cover with remaining sauce and sprinkle Mozzarella and Monterrey Jack cheese over evenly. Cover with lid and cook on high for just under 1 hour or low for 2 hours or until heated through. For oven method: Pour and spread 1/2 cup of sauce evenly in the bottom of a foil-covered 9x13 baking tray. Place stuffed pasta shells on top and bake in preheated oven at 375 F for about 25-30 minutes. Remove the foil and bake for another 5-10 minutes or until the cheese is melted.